What does computer science have to say about beauty? I seek to answer that. Have you ever wondered why it is pleasurable to listen to music? Part of it may be the touching lyrics and the charismatic musician, but one can enjoy electronic music with no lyrics and from an unknown artist. Part of it may be the community building aspect of music, but why music – and why are some songs better than others? Of course, it’s a matter of personal taste. Music enjoyment is, by definition, subjective. But that’s missing the point. Why does anyone get any value from music in the first place? All the music theory in the world can’t explain why our brains our wired for it. This question can be expanded to all art. To answer the question of art, we should examine its opposite. What has the least artistic merit? I do not mean what art is most ugly; even intentionally grotesque art can have an odd sort of appeal to it. I use the term “beauty” loosely in this article. No, what art has the least “art” to it? A blank canvas (ignore the border). By “blank,” I mean that the entire canvas is the same color. In other words, the picture is perfectly patterned. If you zoomed into to that picture on your computer screen, you would see pixels colored white, repeated through rows and columns. Nothing deviates from the pattern of [next pixel in picture = white]. The music equivalent of this would be a track with a single, constant, and unchanging sound. From now on, I will be using the words “pattern” and “order” basically interchangeably, because they both have the same meaning: some repeated, i.e. consistent element. Consider your favorite TV show. The main character probably does not change every episode (unless the show is deliberately subverting that style). We expect a level of consistency with respect to who the main character is. You may not call that a “pattern,” but a pattern is just a repeated sequence. ABCABCABC is just ABC repeated. AAAAAA is a simpler pattern: just A repeated. If a white canvas is at one extreme, what is its opposite? Static. Its audio equivalent is static noise. This one technically has more hues to work with, but it doesn’t seem to matter. Even we allowed every color, it would look like this, hardly better. 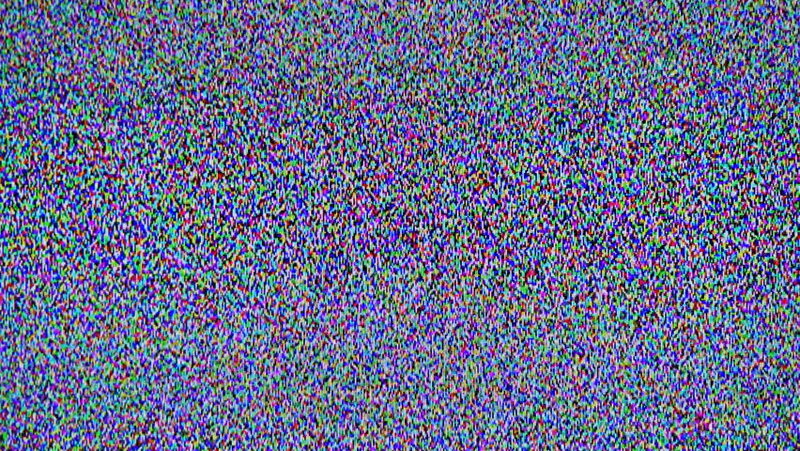 While a white picture is perfectly patterned, a picture of static is perfectly random. Every pixel is (at random) either white or black. The result is as little artistic merit as the blank canvas. If we had to express these two examples in an imagined digital form, the white would be 00000000000000000 (all the same) while the static is 1667598812728326 (random). Don’t stress the details, I’m just trying to make a comparison. Another way of saying random is “non-compressible.” The information from the white is perfectly compressible; just say “all white” and that abbreviation allows you to replicate it perfectly. On the opposite extreme, you cannot compress the static information any more so than it already is. To recreate the image perfectly, you would have to detail every pixel. Ordered randomness, stated alternatively, patterned chaos. Picture a horseshoe. One end of the horseshoe is blank. The other end is static. The base of the horseshoe is art. You can read this like a graph, with the x-value being amount of pattern vs randomness, and the y-value being (lack of) artistic merit. Why is this the case? Consider the circumstances of our brain’s evolution. To keep us interested, something has to be novel enough that we perceive it as new information, while also uniform enough that we register it as a trend, not a random fluctuation. In the conditions that our brains evolved (and still today) new information could be very valuable. Information was the difference between hunting in the right or wrong place, or harvesting at the right or wrong time. The acquisition of information, thus, would be something desirable for us, something pleasurable to us (the pleasure acts as an incentive to get it!) This is the drive of curiosity. And what is the property of useful information? It’s ordered randomness, patterned chaos. It’s beautiful. It’s art. Even if the information itself isn’t actually practically useful, it can mimic the state of something that is. Art can mimic any pattern that information can take, formal or informal. In this way art can supply any emotional state you can get from finding something out. Whenever I listen to a song I discover a new emotion that I never could have otherwise imagined. A pattern of notes is symbolic of something extremely broad yet compelling: an representation of how information can play with our emotions. To build on this, an art piece is not merely a series of random and non-random entities. A beautiful piece consists of patterns within random elements within patterns within even more random elements. These patterns build inwards on themselves like a fractal pattern. This nesting of patterns in chaos accumulates as a cascade. This shouldn’t be misconstrued as, “art should always be complicated.” Overcomplicated art is too random; it confuses us. The appeal of minimalist art is that it is ordered. At the beginning of this article, I teased a reference to computer science. How can art be expressed in terms computers can understand? It’s not so hard as you might think. The notes to a piano song can be assigned values (A-G corresponding to 1-7). The rhyme schemes of poetry can be codified (for example, The Raven’s rhyme scheme is ABCBBB not counting internal rhyme). A good-tasting food has a codified recipe. Artistic works are more complicated than those reductions, of course, but there’s no element of an artistic work that can’t in theory be codified. So if art can be put in a form computers could understand, can we hypothetically create a computer program that spits out a unique piece of artwork every time it’s run? We can create a program that creates static. You just have to loop through a random number generator. We can create a program that creates white. You simply loop through the color “white” over and over again. To create the ordered randomness of art requires both repetition (loops) and random number generation. The problem is that the patterned chaos of art is so intricate, so integrated, that a program would have to be inordinately complicated to recreate it. And the more intricate, and the more integrated, the more difficult it is for the generation algorithm to create. From these facts, we can devise a simple heuristic to figure out how “artistic” something is. This next is purely hypothesizing. Recall that pure randomness loops around to being as boring as repetition. Given that, for the below heuristic, we will discount the process of random-number-generation, and assume it to be instantaneous (which it’s not). Assume that a computer’s random() function has zero runtime. Given a piece of artwork, deriving the least complicated computer program that could autonomously generate the equivalent of it (100% design-by-computer), the worse the runtime of that algorithm, the more “artistic” the art piece, and that we define artistic beauty. What this essentially means is, the more intricate and integrated the patterns of an art piece, the harder it is for a computer to make, the more beautiful it is. I have talked about job automation in the past. For the reason above, I have confidence that creative work, which generates beautiful pieces, will be the last to go.